Bringing a playful and vibrant feel to the shop front of this luxury tea and coffee retail store. Brief: Rich, golden lighting was required to accentuate the luxurious branding of The East India Company. As well as being eye-catching, the lighting needed to be engaging. 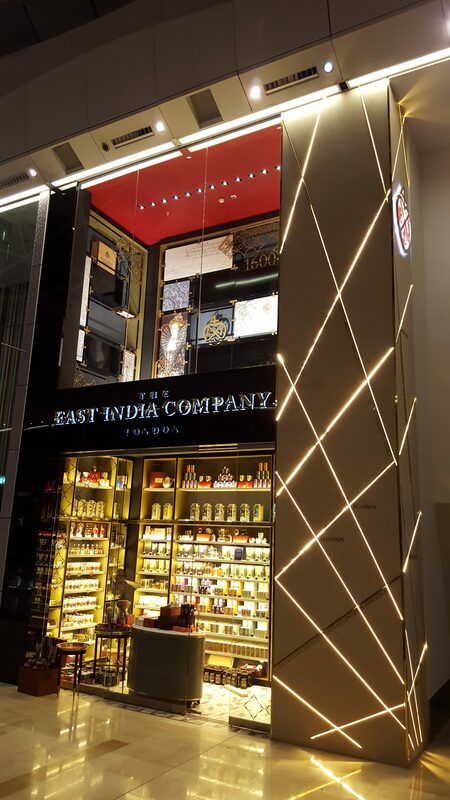 Solution: Digital tracing LED strip lighting was supplied and fitted in the bespoke profiles that are recessed onto the store front of the East India Company shop, situated in Westfield shopping centre. The digital strip was commissioned to create a dynamic, digital tracing sequence, capturing the attention of passersby and welcoming them into the store.